Florence Cady is a rising star of stage and screen. She was one of the leads in the successful UK tour of Ruth Rendell’s Gallowglass, and stars in a new horror feature, Crucible of the Vampire. She kindly took time out [in July 2018] from her ‘wedmin’ (wedding admin, apparently – what a great word!) to talk to me about how she got those roles, why she chose acting as a career, and what she’s planning next. I also found out her dad was in one of my favourite TV comedies! I’m always interested in how and why people become actors, when it’s so notoriously difficult to make a living. You have a fantastic academic record, with A-grades at everything in school, and a first class honours degree from a Russell Group university, so you would have had a range of career opportunities. You were clearly intent on pursuing an acting career, but was there any pressure from your parents or teachers to get a ‘proper job’ instead? I am pretty lucky in the sense that I have quite laidback parents. Although I went to a high-pressured girls’ school, my dad is an actor and my mum works in fashion, so having two creative parents allowed me to explore the arts. As an actor, my dad never actively encouraged me to act, as he knows first-hand how challenging it can be as a profession, but he fully supported me when I told him that it is what I wanted to do. At school, they definitely encouraged me to finish my academic qualifications before entering the industry, and when I got into RADA [Royal Academy of Dramatic Art] they helped me put my university application on hold until I had completed the course. We had a great drama department who always put on fantastic productions, so I got to practise in a safe environment before entering the industry. I didn’t know your dad was an actor. Can you tell me a bit about his career? And are any other family members involved in performing? My dad, Gary Cady, got a place at the University of Oxford to study English, but chose to go to Guildhall instead. He won the Carleton Hobbs radio award in his final year, which gave him a year-long contract with the BBC. He was one of the lucky ones, going on to have a 30-year-long successful career, which allowed him both to travel with work and also be around to help bring up my sister, Alice and me. He is fortunate enough to have completed a nine-month run of Cyrano De Bergerac with Robert Lindsay in the West End, a film called Queenie with Kirk Douglas, and play the lead role in a series called Brass with Timothy West – and that’s just to name a few. No-one else in my family performs professionally, but they are all very creative. My sister was the production researcher on the recent Amy Winehouse documentary called Amy directed by Asif Kapadia. Her partner is a re-recording sound mixer for film. He has also worked with Asif on the documentary Senna (2010), as well as Justin Kurzal’s Macbeth (2015), Assassin’s Creed (2016) and is currently working on Josie Rourke’s directorial debut Mary Queen of Scots, starring one of my favourite actresses, Saoirse Ronan. 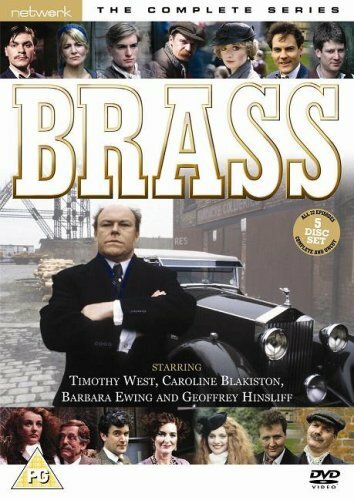 Ah, I loved Brass, a wonderful 1980s comedy, and I remember your dad’s character very well – Matthew, the drippy would-be poet! I was lucky enough to see you on stage in the Middleground Theatre Company’s production of Gallowglass as the female lead, a character described as ‘the most beautiful woman in the world’ no less, in a complex Ruth Rendell thriller. That must have been a very demanding role on a such a long tour. Can you tell me something about that experience and how it came about? Gallowglass was the first theatre job I got with my new agent, Michele at Milburn Browning, who I signed with in May last year . She looks after actors, David Mitchell and Simon Webb. It was also my first UK tour. I have always been interested in the role of the femme fatale, as I wrote my dissertation at the University of Manchester on ‘Women in Film Noir: The Ongoing Fascination with the femme fatale from Film Noir to Neo-Noir’. Nina Abbott [the character in Gallowglass] possessed characteristics of this female archetype: sexually alluring on the surface but deeply emotionally vulnerable underneath – a powerful yet troubled individual with a tormented past. It was a role I was interested in playing from the get-go. I had never read any Ruth Rendell, however, but once I read the novel of Gallowglass I got the sense that this was going to be a complex thriller, a dark and disturbing ‘whodunnit’, and I was ready to get on the road. I think touring is a rite of passage as an actor. It is a lesson in building stamina, but also a brilliant opportunity to practise your craft every day, which unfortunately, as most actors know too well, is often not the case, as we spend a large majority of our time doing anything other than acting to support ourselves financially. Middleground Theatre Company have great relationships with theatres all over the UK and have been a successful touring theatre company for 30 years! I had never worked with Michael Lunney and Richard Walsh before, but I knew that Mike was well-known for reusing actors he has worked with and I was keen to audition for him. It was definitely a challenging experience, but also extremely rewarding. We performed the show 90 times over five months in 15 different venues all across the UK, changing location every week! I loved performing in some of the smaller venues like The Palace Theatre, Southend-On-Sea, which I believe, has one of the steepest raked stages in the UK. The Devonshire Park, Eastbourne also had a lovely intimate atmosphere, and it was a privilege to perform at the renowned Yvonne Arnaud Theatre, Guildford. Our biggest audience was 1,200 at the Theatre Royal, Norwich. Before then, the largest audience I had performed to was at the Pleasance Grand with a company called The Young Pleasance in a show called Soho Stories (2010). I believe your first film was The Burning in 2016, a short, in which you play one of the lead roles. It sounds an intriguing project. How did that come about and how did it make you feel about film acting as a potential career? Yes, my first short film was The Burning, which I shot with The London Film School on location in a Victorian house in Kent for a week. I auditioned via casting call pro [a casting website, now known as Mandy.com]. I had, at the time, recently taken part in a number of workshops with National Film and Television School, working with young, upcoming directing students on the Fiction Foundation course. NFTS and LFS are two of the best film schools in London, and I thought it would be a good way to develop relationships with other young creatives, whilst also building up my showreel. The Burning circulated the film festivals and received a Special Jury Mention for Best International Short Film at Feratum Festival, and was nominated for Best Michoacan Film at Morelia International Film Festival. Crucible of the Vampire is your new horror feature, starring Neil Morrissey. The trailer looks fantastic, and you feature prominently as Scarlet. What can you tell me about this film? How did you come to be involved and when and how can we see it? Crucible Of The Vampire is a Gothic vampire thriller set in the present day in Shropshire. It is set in a large country house, and stylistically it draws from classic British horror of the 1950s and ‘60s, along with modern Korean and Japanese psychological horror. Neil Morrissey is a family friend. He went to the same drama school as my dad, so it was a strange coincidence and welcome reassurance, to be working with him on my first full length feature film. Scarlet is another strong female character. She is multi-faceted, as a petulant child, dangerous seductress and manipulative psychopath. The film was premiered at the European Film Market earlier this year, as well as Cannes Film Festival. The plan is for a small theatrical release, but it has also just been turned into a graphic novel which is now available to buy. Well, I look forward to seeing it – very much up my street. Now you have experience of film (short and feature) and stage acting, how do they compare? And do you have a preference? Ah, the age-old question! It is very difficult to compare acting for stage and screen, as they are two entirely different disciplines. Acting for screen is also ‘in-the-moment’ but you do it again, and again, from different angles, with different intensities, maybe even a new objective each time, until the director has the shot s/he wants. In that sense, it is maybe deemed less autonomous, but if you work with a good director it is also very collaborative. There is also the inevitable question of scale. In the theatre, you have to project and make sure you are reaching every member of the audience, whereas in film you can deliver a more subtle, nuanced performance without such onus placed on audibility. I believe your next big project is your wedding: congrats! Is your husband an actor too? And what else lies in your future? Any other projects lined up for us to look forward to? Yes, I am getting married at the end of September, so it has been all systems go on that front. Jack is also an actor, so we must both be as mad as each other! He recently got back from touring in Nell Gwyn with the English Touring Theatre. Up next: my sister and I are working on a few ideas to develop into a show. She is part of the young directors programme in conjunction with the Young Vic, and we have always talked about working together, so now might be the time! Watch this space. Check out other recent Piece of Pink Pie interviews with Mhairi Calvey, Sanna Kaappola, and Eugene McGing. If you’re involved in arts and entertainment, Weltch Media’s services may be of interest. Tags: Amy, Amy Winehouse, Asif Kapadia, Assassin's Creed, Brass, Cannes Film Festival, Crucible of the Vampire, Cyrano De Bergerac, David Mitchell, Devonshire Park, Eastbourne, English Touring Theatre, European Film Market, film noir, Florence Cady, Gallowglass, Gary Cady, Guildford, Josie Rourke, Justin Kurzal, Kent, Kirk Douglas, London Film School, Macbeth, Mary Queen of Scots, Michael Lunney, Middleground Theatre Company, Neil Morrissey, Nell Gwyn, Palace Theatre, Pleasance Grand, Queenie, RADA, Richard Walsh, Robert Lindsay, Ruth Rendell, Saoirse Ronan, Shropshire, Simon Webb, Soho Stories, Southend, The Burning, Timothy West, University of Manchester, University of Oxford, Young Pleasance, Young Vic, Yvonne Arnaud Theatre. Bookmark the permalink.